Summer is tomato time around here. I had tomato salad last night and for lunch I had homemade tomato soup, had it yesterday too. It is all gone but I am wishing I had another bowl in the fridge for tomorrow. Last October I made a big batch and froze it in plastic containers, each two servings. I felt like I was back in a sunny summer day whenever I had it for lunch last winter. I add the cream before serving; not before freezing, FYI. Your family will love this soup with a sandwich or salad. It is naturally gluten free. GF croutons would bring a lovely crunch to it if you have any. I make it a lot in late summer, commonly used recipe…I never think to take pictures of the process. Next batch! This was made with just a touch of half and half, not cream; plenty creamy for me! Or: use your Instant Pot Electric Pressure Cooker to make it; saute as per recipe in the pot, add the rest of the ingredients and put the lid on and cook under pressure 20 minutes. You might have to blend it a bit with an immersion blender. I sometimes leave off the cream but my next paragraph is how to add that…. The finish: Add the cream or milk to the soup and process it by blending with an immersion blender or run it through your food processor. I use my cute little boat motor blender and leave it chunky just as I love soup to be. Reheat the soup over low heat just until hot and serve plain or with julienned basil leaves and/or GF croutons. Enjoy! Original post of this was way back in the summer of 2014. Minor changes and additions. This soup did not disappoint me with its unusual flavors and I enjoyed every naturally gluten free spoonful. I think you will too. I did modify it somewhat from the original recipe, of course! I changed the cilantro for parsley as I am not fond of cilantro and there is a reduced amount of garlic and of orange juice. 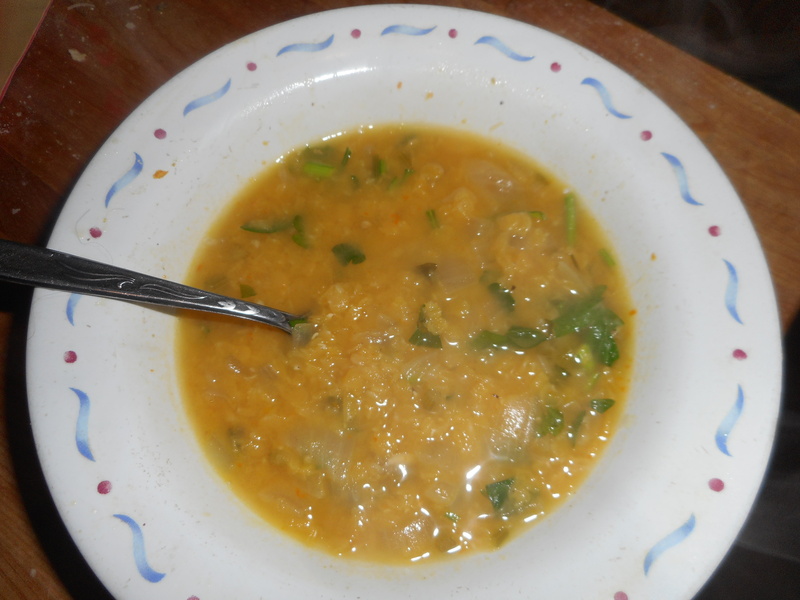 I love the bright flavors in this potage and as a bonus it is very healthy with the fresh orange juice, lentil beans, garlic and onions. If you love cilantro, sub it in for the parsley by all means. 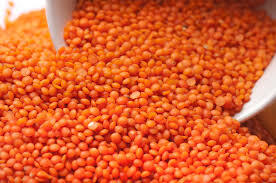 Note, the red lentils, which you can get at the health food store, turn a soft maize color when cooked. I think some brands are more orange in color but mine usually turns that soft yellow. This recipe is a bit spicy but light as there isn’t any dairy or meat in this soup. You will find this a great spring soup. If you use veggie broth it becomes vegetarian. These are the sauted onions resting in a bowl before going back into the soup. Broth in the soup, lentils are low in the pot! Wash and dry the bunch of parsley. Cut off the bottom 2 to 3 inches of the stems and chop them fine. Set them aside. Coarse-chop half of the remaining parsley leaves, refrigerating the rest for another dish. Generously film the bottom of a 3 quart saucepan with olive oil – like two or three tablespoons and heat it over high heat. 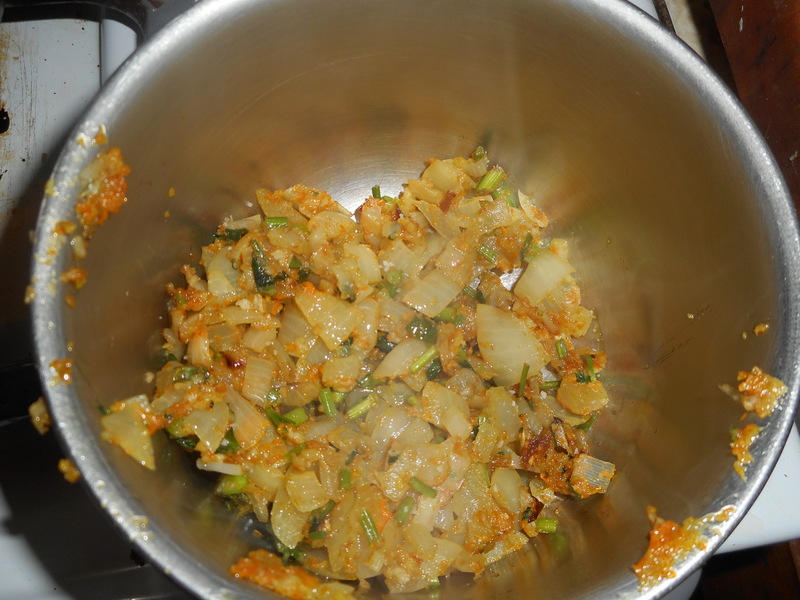 Stir in two-thirds of the onions, and season with salt and pepper. Sauté until the onions just begin to brown. Blend in the parsley stems, half the parsley leaves which you chopped, garlic, ginger, ground coriander seed, and the orange zest. Sauté all of that for about 20 seconds over high heat, until the pan smells fragrant. Scrape out into a bowl and set aside. 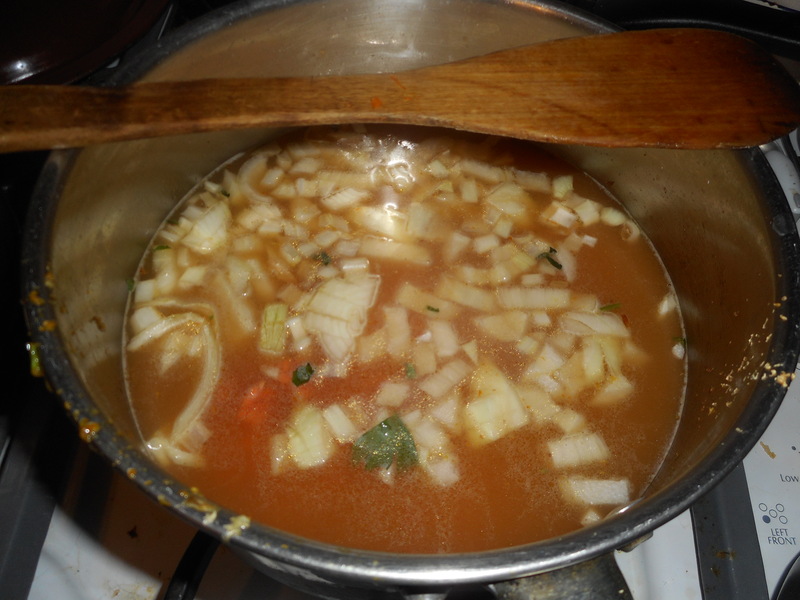 Pour the broth, water, lentils, and remaining onions into the same saucepan. Bring to a gentle bubble, partially cover, and simmer for 7 to 10 minutes, or until the lentils are nearly tender. Add the sautéed onions and seasonings and additional salt and pepper to taste. Cover the pot tightly and simmer for another 15 minutes to blend the flavors. Stir in the juice from half a lemon, the juice of the zested orange, and additional water, broth or orange juice to taste, starting with 2/3 cup. Then warm and sample the soup for salt, pepper, and lemon juice, adjust them as needed. Scatter the remaining parsley tops over the soup, and ladle it into deep bowls. The original recipe before modifications came from The Splendid Table’s How to Eat Supper by Lynne Rossetto Kasper and Sally Swift, Clarkson Potter, 2008. Originally posted March 2015. No changes to recipe. Secret weapon: I always add a cheese rind or two saved from a chunk of Parmesan cheese. It really ups the flavor of the soup. And if you get a bit of it in your soup bowl the oozy cheesy goodness will be your prize! Notes for 3/7/18. I did a quick heat and soak of the navy beans in a sauce pot and then I cooked them for 11 minutes in my Instant Pot. Great way to get it going quickly. I used broken up fettuccine pasta for this version. I used cut up pancetta I got at Aldi’s instead of prosciutto. 2 cups of dried cranberry, navy or kidney beans, soaked overnight in lots of filtered water. Be sure to pick over them for foreign objects. Directions: Drain the soaked beans, rinse well, return to cleaned pot and cover with fresh filtered water, add bay leaf and cook 1-2 hours until soft. Add water if it gets low. Turn off and let rest while you make soup. Skip step if you use canned beans; do drain them and rinse. Just add them where you would add the beans you soaked and cooked yourself. Heat EVOL in big sturdy soup pan, I like a thick bottom to keep the soup from burning easily. Add onion and cook 5-6 minutes, add garlic, stir and cook a minute, add prosciutto which you have diced up into small squares and the parsley. Cook for a couple minutes, add the tomatoes, carrots, celery, turnip, hot pepper and stir well. Add a tsp. of salt. Cook uncovered about 12-14 minutes. Add any bean water in the pan. I often end up adding 1-4 cups of water during this point if there is no bean liquid. Mush up half the beans in a food processor or with a potato masher. Add to soup. Reheat and cook 5 minutes, add rest of beans, reheat and then add the pasta. Cook just the length of time the box says, stirring it every 2-3 minutes. Taste and add more salt if needed and some fresh black pepper. Turn off and let stand at least 10 minutes before serving. True Italians often let it stand for hours and they serve it room temp. I sometimes drizzle some best quality EVOL on the top of each bowl before digging in. A big bowl of that will warm you up for sure! Originally posted by me in January 2015.